When Net-a-Porter reached out to invite me to be part of a press program celebrating its Jet-a-Porter vacation shop, I immediately said yes. Did I want to elevate my summer holiday look with some key pieces from their vacation edit? Well, yes, absolutely. There was just one problem: My chic summer plans at that point included a trip to visit my parents. No disrespect to my high school bedroom or my mom’s backyard garden, but I’m not sure the vibe would read aspirational getaway. Thankfully, my spontaneous friend and colleague stepped in, and a girls trip to Marfa, Texas, was born. What is there to do in a west Texas desert town of 2000 you may ask? The remote city is home to a modernist art colony, which means the entire city feels like it’s been art-directed. There is not a single shop, building, or sign there that doesn’t tickle my aesthetic-loving soul. There's basically the perfect spot for photo shoot around every corner, with a great food and shopping scene to boot. Scroll down to see what I mean and shop my Jet-a-Porter looks. Marfa is known as an artist enclave, so if you didn’t see any art, you kind of did it wrong. There are a handful of galleries around town, which are easy to pop into, but I would recommend the Chinati Foundation tour for a more immersive experience. I can’t attest to the four-hour tour, which sounds intense, but the two-hour version was just about right. You get a nice sampling of Marfa’s most notable artists, and opportunities for excellent content abound at Donald Judd’s concrete works (pictured above) and Dan Flavin’s fluorescent pieces (pictured below). Insider Tip: The postcard selection at the gift shop is the best in town. Also, wear comfortable shoes—there’s quite a bit of walking on the tour. The short journey out of town to see the Marfa Lights is definitely worth it. Just what are the mysterious moving lights? See for yourself! The lights are visible after sunset year-round. Insider Tip: Pack a blanket, as it can get chilly while you’re waiting to see the lights. El Cosmico hosts Cosmic Karaoke the first Saturday night of every month. It’s a blast—my personal high point was one endearing local’s iteration of Clarence Carter’s “Strokin‘.” Also, if you’re up for some glamping, El Cosmico is famous for its Instagram-worthy tents, teepees, and yurts. Insider Tip: The gift shop is incredible and worth a stop even if you’re not staying there. As a general note, Marfa is good at gift shops. White Sands National Park is a serious detour from Marfa, but it is 100% do-not-question-me worth it. To get to Marfa, most people fly into the closest airport in El Paso, Texas. White Sands is an hour and a half north of El Paso, and Marfa is three hours from El Paso in the opposite direction. This is a lot of driving in your Toyota Camry rental. However, the otherworldly experience of White Sands is not to be missed. If you are even vaguely interested in creating great #content, make sure to go during sunset. The lighting gets heavenly and is frankly vastly different from the late-afternoon light. And here’s an extra bonus: White Sands is one of the lesser-visited National Parks, so once you wander a dune or two away from the road, it’s easy to feel like you have the place to yourself. Insider Tip: Pack a picnic, and make sure to rent sleds from the gift shop for sand sledding. While the comforts of hotel room service are always tempting, I’ve learned a charming Airbnb is almost always the way to go for getting in touch with the spirit of a place. The Love House at Corte Del Norte is perfect for just that. The décor is inspiring, and the backyard is heavenly (stock tank pool, adobe-and-glass dining shed, and fire pit). Also, the location could not be more central—every single thing in town is walkable from the property. Insider Tip: The Get Go grocery store is just around the corner. Stock up on queso, chips, and wine for an al fresco snack. Mano is a special little boutique that has some great vintage finds and local craft wares. Insider Tip: They sell engraved gold key-ring tags that would make a great personalized gift. I may be biased toward Moonlight Gemstones as a new age–empathetic Angeleno, but I had a blast picking out stones here. I left with pretty mementos that are supposed to amplify positive energy and channel greater intuition. Insider Tip: Ask the owner if he has any geodes he’s about to crack open. His passion for rocks is contagious, and he’ll happily show you around his workshop out back. You know your mom needs a souvenir, and moms love soap. Marfa Brand Soap makes handmade bars that smell incredible. Insider Tip: Pick up one of the store’s natural pumice stones or loofahs to make a multi-part gift that’s sure to impress. Marfa Book Company is housed within Hotel Saint George, and it puts most hotel gift shops on the planet to shame. From coffee-table books featuring local artists to hand-carved candles, this store has something for everyone. Insider Tip: The store houses some of the best finds from Freda, one of Marfa’s most-loved boutiques that sometimes closes for the season. My favorite breakfast of the trip was at Do Your Thing. You enter the cozy café through a backyard complete with chickens roaming around and a very sleepy dog. The breakfast menu is sparse, ever-changing, and delicious. Sometimes there are egg dishes—we lucked out with the pictured toasts and coffee. Insider Tip: Their gift selection rivals their breakfast fare. I walked away with local homemade bitters, a mug, and postcards. As far as local grocery stores go, it doesn’t get more charming than The Get Go. The store features a range of local products mixed in with your standard healthy brands. Insider Tip: The canvas bags printed with the store’s logo are irresistibly cute, and, in my opinion, a must-buy. The fact that you already have a thousand reusable bags doesn’t change this. Bar Nader Pool + Grill at Hotel Saint George has quite the lovely pool scene that serves up three different kinds of frozen drinks. Take your pick from a frosé, margarita, or prickly pear. Insider Tip: If you aren’t staying at the hotel (which is the best hotel in Marfa, if you’re partial to a hotel experience), the pool is open to the public starting at 4 p.m.
Everyone in town will tell you Stellina is the best restaurant in Marfa, and they’re not wrong. The light Mediterranean-style menu is the perfect antidote for a hot Texas evening. Insider Tip: If they have the starter with burrata, spek, and melon salsa, get it and don’t look back. It doesn’t get more authentically Marfa than the Lost Horse Saloon. This no-frills cowboy bar plays everything from country tunes to Shaggy. Come for the low-key vibes and outdoor area complete with a swing; stay for the cute dogs that wander comfortably among the crowd. Insider Tip: If you’re craving a late-night snack, the bar makes greasy, yummy food in the back room. If you had a big night at Lost Horse Saloon the night before, Marfa Burrito is an ideal way to ease into the day. Be prepared for a tasty breakfast burrito longer than your forearm. PS: The tortillas are homemade and hands down the best part. Insider Tip: Be prepared to order in Spanish if the owner is at the register, and it’s cash only. 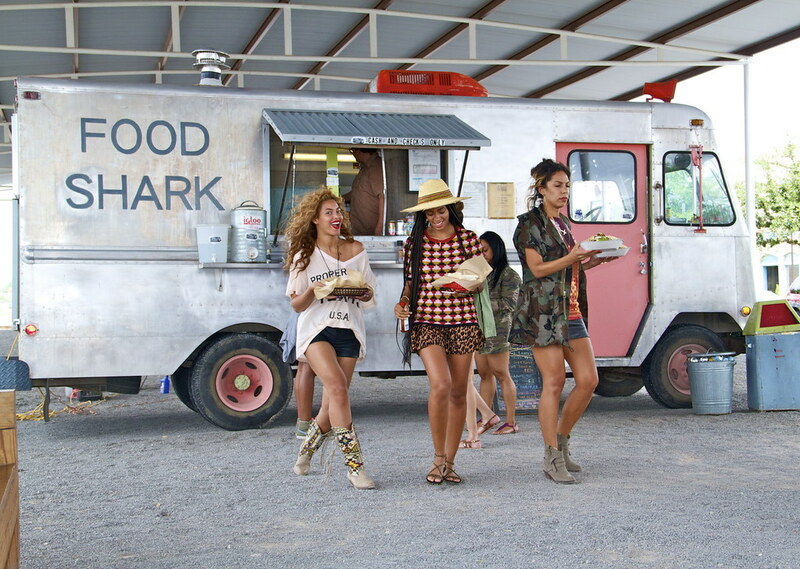 The kitsch factor runs high at Food Shark, a Mediterranean food truck that is Beyoncé-approved. You can enjoy your Marfalafel sitting at a cluster of school desks outside the truck, on a patio decorated with ’70s-style living room furniture, or inside a school bus bedecked with string lights. Insider Tip: Like a lot of places in Marfa, the hours can be a bit hit or miss. Use this guide to see when restaurants are open. Next up, check out our travel guide to Cuba.